Geographic Information Systems (GIS) are pervasive and have become an essential feature in many professional disciplines. Prior to adoption, implementation or use of any GIS, a system must be properly designed to meet its organizational goals, and this requires comprehensive strategic planning to take place ahead of the design. In this article, we discuss methods for strategic planning in GIS design, drawing from literature in Information Systems and GIS research and practice, and business management. We present a four-step approach toward planning for GIS design that will ensure the system is well-suited to further an organization’s long-term functions, applications, and users’ needs. Nedovic-Budic, Z., Knapp, E., and Ran, J. (2018). Strategic Planning for GIS Design. The Geographic Information Science & Technology Body of Knowledge (3rd Quarter 2018 Edition), John P. Wilson (Ed.). DOI: 10.22224/gistbok/2018.3.8. This entry was published on September 25, 2018. This Topic is also available in the following editions: DiBiase, D., DeMers, M., Johnson, A., Kemp, K., Luck, A. T., Plewe, B., and Wentz, E. (2006). Planning for Design. The Geographic Information Science & Technology Body of Knowledge. Washington, DC: Association of American Geographers. (2nd Quarter 2016, first digital). Information systems (geographic or other) lie at the confluence of three elements: people / organizations, data, and technology. In the context of Geographic Information Systems (GIS), people might include urban planners, public officials, spatial analysts, business intelligence managers, environmentalists, engineers, and the general public. Organizations could include government agencies, municipal planning offices, non-profits, utility companies and the private sector; data might include census tabulations, GPS tracks, transit routes, street centerlines, parcel boundaries, or flood-plane zones; technology could include database management software for storage and retrieval, algorithms and computing routines for analysis, and web and information communication technologies (ICT) for display and dissemination of products. Together, these elements circumscribe a set of complex activities with many actors, costs, objectives, applications, and deliverables, any of which could be in concert or conflict with one another at a given time. Designing a GIS that interfaces effectively with these multiple interacting elements is complex not only because it must attempt to solve simultaneously many different problems, but also because the landscape of GIS technology — and the organizations that use it — is changing rapidly. In addition to the three elements mentioned above, GIS design deals with the implementation process and phasing, application development, budgeting, staffing support, access, privacy, and management, among others. Given this uncertain context with many possible outcomes, planning for the design of a GIS is essential for its success. In the early GIS management literature, Obermeyer and Pinto (1994) contrast rigorous planning to ‘run and gun’ style which inevitably leads to failure. The approaches to planning effective (Geographic) Information Systems design draw from both research and practice. Despite their differences, these varied approaches to (G)IS design share many of the same requirements and thus offer important guidance to the most effective way to design and implement GIS. Both research and practice approaches require careful consideration of the uses to which the system will be put and the users with whom it will interact; both require thoughtful analysis of current and alternative conditions—and some way to quantify, measure, and evaluate these possibilities; both require the careful allocation of scarce labor, time, and resources; and both share unforeseeable impediments as well as consequences arising from poor design. For this reason, we argue that it is imperative for organizations to consider both research-based and practice-based approaches to GIS design. In the field of IS research, there are two different research paradigms: behavioral science and design science (Hevner et al., 2004). The behavioral science paradigm, which is also called the ‘interpretive research paradigm’, explains or predicts social phenomena (Peffers et al. 2007). This paradigm aims to develop or verify theories (Hevner et al., 2004), applying a deductive or inductive methodology as is generally applied in social science research (Babbie, 2013). In contrast to the behavioral paradigm which focuses on the creation of knowledge, the design science paradigm produces new and innovative artifacts and aims to extend the problem-solving capabilities of human beings or organizations. Focusing on design processes or patterns, Simon (1969) proposed a Generate-Test cycle and defined the term ‘artifact’, which had a great impact on early studies in IS design. For Simon ‘the significant part of the environment consists mostly of strings of artifacts called "symbols" that we receive through eyes and ears in the form of written and spoken language and that we pour out into the environment’ (p. 2). Some artifacts are natural and some artificial or human-made, with (G) IS falling into the latter category. Building upon Simon’s Generate-Test cycle of iterative artifact design and evaluation, Nunamaker et al. (1990) proposed a five-step system development research process with loops. This process requires designers to identify the design questions or objectives, investigate relevant ideas, and construct a conceptual framework before developing an IS. The conceptual framework leads to the development of a system architecture and defines system functions and components. The third step of this process is to propose alternative designs and screen the alternatives. The next step is to build the actual system or the prototype. The last step is to evaluate the system by observation or experimentation. The design process comprises only one part of IS design theory. According to Walls et al. (1992), a comprehensive theory of IS design should also include "Kernel Theories" from natural and social science that govern the design and process requirements. These theories facilitate understanding of what constitutes effective design, provide a knowledge base for deriving a set of design guidelines, and undergo a validation process through case studies. March and Smith (1995), made a similar assertion that theory development and theory justification through scientific research methods was a part of IS design research. In their IS research framework, the authors combined the Generate-Test cycle and natural science activities in a ‘discover-justify’ process. They introduced the discover and justify activities because, in addition to knowing how to design and develop IS, we also need to know how and why the IS works within its environment. This process often precedes system building and evaluation and ensures a rigorous and systematic approach. This combination of the design method and the scientific research method is also seen in the latter IS design framework suggested by Hevner et al. (2004). The authors relate the knowledge base and IS research via rigor and applicable knowledge, and IS research and the environment via relevance and business needs. Another stream of IS design met­­hodology, starting from the 1990s, emphasizes the strong connection between participants and design. For example, Simon (1996) updated his earlier book The Sciences of the Artificial (Simon, 1969) and included the concept of ‘satisfying design’ instead of ‘optimum design’. Since then, concerns related to participants, human satisfaction, and user feedback have gained prominence in IS design methods. For example, special concern for human context and satisfaction is apparent in the model of the IS design process proposed by Peffers et al. (2007) (Figure 1). In this model, design activities can be initiated not only by triggers such as a problem, an objective, or a practice, but also by clients and context. This process also includes a demonstration stage so that the clients’ satisfaction can be investigated and can be fed into the initiation of the design activities. Moreover, this model features loops from the evaluation and communication stages to the design objectives and development. These loops allow clients’ feedback and satisfaction to influence the design process. By applying this model of the design process, Geerts (2011) designed an accounting information system which proved the usefulness of this model in guiding practice. Figure 1. 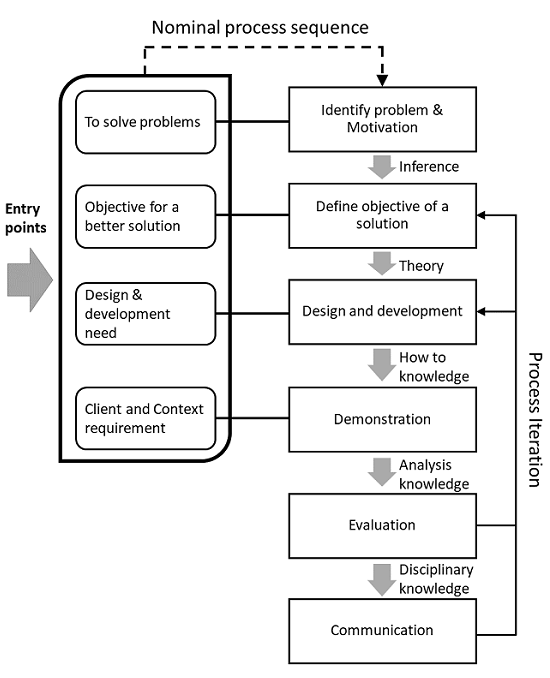 Design Science Research Methodology (DSRM) process model (after Peffers et al. 2007). The design methods introduced above, whether they involve users or not, focus on the IT artifact as the final delivery of design. According to Alter (2008, 2003, 1999), the design of IS should focus on the "work system" rather than the artifact itself. "A work system is a system in which human participants and/or machines perform a business process using information, technology, and other resources to produce products and/or services for internal or external customers" (Alter, 1999, p. 12). Parallel to this development, by the 1990s the IS research started to connect closer to organizational practices by highlighting the process of change and learning in conjunction with socio-technical design and evolutionary system development (Eason 1988). Over the last two decades, the IS literature has documented a steady movement toward the intentional design of “socio-technical” systems, a philosophy guided by the notion that “design should be a process that takes into account both social and technical factors that influence the functionality and usage of computer-based systems," contrasting the ‘"techno-centric approaches to systems design [which] do not properly consider the complex relationships between the organization, the people enacting business processes and the system that supports these processes” (Baxter & Sommerville, 2010 p.1 ; see also: Norman, 1993; Goguen, 1999). As the preceding section made clear, across the (G)IS research literature, over the last few decades, there has been a steady trend toward more inclusive (G)IS design that is focused not only on the technical implementation but also the users and their needs. In the practical literature, many of these ideas are mirrored, albeit in different language and presented in slightly different concepts. Nonetheless, this synergy bodes well, and speaks to the field’s emerging maturity as these ideas become calcified. Across the practical Information Systems literature, authors on the side of practice consistently point out the myriad benefits associated with deliberate strategic planning of the system; GIS is no exception. The purpose of such planning, according to Huxhold and Levinsohn, is to create the “framework for successfully identifying the best candidates for GIS technology application, and for identifying the planning and design process that is most likely to yield the expected benefits. [Strategic planning] also provides the framework for ensuring that GIS design aligns with business plans, organizational structure, existing systems, and staff competency” (Huxhold & Levinsohn, 1996, p. 53). Obermeyer and Pinto (1994) are even more direct; they argue that among the characteristics of successful GIS implementation, rigorous planning is the most important. They suggest that "the role of planning requires that the manager develop a set of goals and objectives and create both long-range and sort-term plans for achieving these goals" (p. 37). A decade later, ideas about the utility of (strategic) planning for information systems remains prescient. For instance, Cassidy (2005) makes the case that “the foundation of the strategic planning process is that business direction and business requirements drive the IS direction and computing architecture” (p. x). In other words, a technical solution (like GIS) is inadequate unless it is designed explicitly to further organizations goals and is developed to support its users. To achieve these goals, Cassidy outlines a four-step planning model that includes Visioning, Analysis, Direction, and Recommendation phases (Figure 2). Cassidy’s four-step model is elegant and parsimonious though by no means entirely original. Huxhold and Levinsohn (1996, p. 55) outline a similar model that includes 8 steps, although the overall process is nearly identical. In this article, we choose to highlight Cassidy’s for its simplicity. The four steps are as follows: “In the first phase, visioning, establish and initiate the planning project and process…In the second phase, analysis, thoroughly document and objectively analyze the IS environment…in the direction phase where the mission and vision for IS is articulated using the business situation and direction as a basis… [and] in [the recommendation] phase, document the detailed roadmap outlining projects for the next several years” (Cassidy, 2005 p. 41-46). In the sections below, we describe Cassidy’s four-step model with particular attention to its applicability in planning for GIS design. Figure 2. Cassidy's model and Phases. During the visioning process, members from across the entire organization discus the organization’s mission, vision, values, goals, objectives, business priorities, and how GIS will help meet the organization’s goals. The visioning phase requires GIS planners and designers to ask: Why does the organization need GIS? What issues is the organization facing that could be solved by GIS? Who in the organization would benefit from GIS? The information systems literature drawn from both research and practice is clear that during this phase, broad organizational inclusion is paramount. In line with a socio-technical approach to GIS design a broad inclusion of all relevant departments, business units, managers, operations, and people is an inherent part of IS / GIS planning and visioning in particular. 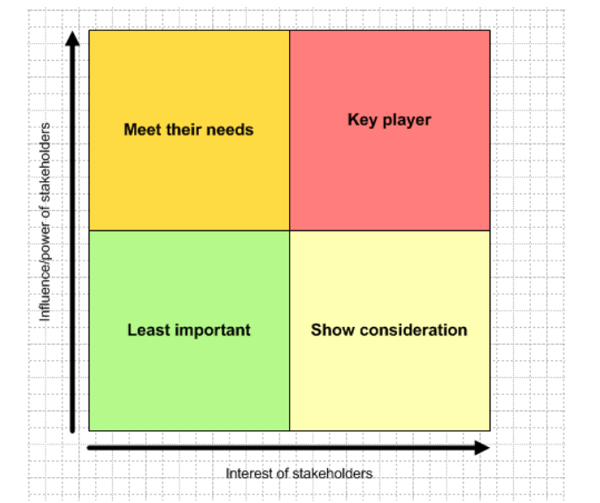 To ensure appropriate participation, organization members sometimes complete “stakeholder matrices” which are used to plot the juxtaposition of stakeholder influence versus their interests (Figure 3). Stakeholder analysis in conflict resolution, project management, and business administration, is the process of the assessing a decision's impact on relevant parties. This information is used to assess how the interests of those stakeholders should be addressed in a project plan, policy, program, or other action. Once plotted, these matrices help show which stakeholder interests can (and should) influence the planning process the most. This process could also be related to the assessment of needs and requirements that take place later in the system planning process. During the visioning phase, appropriate attention to socio-technical design means that interviews, workshops, surveys and other communication techniques take place across the organization; during these meetings, members identify and discuss the organization’s goals and objectives. S.W.O.T. 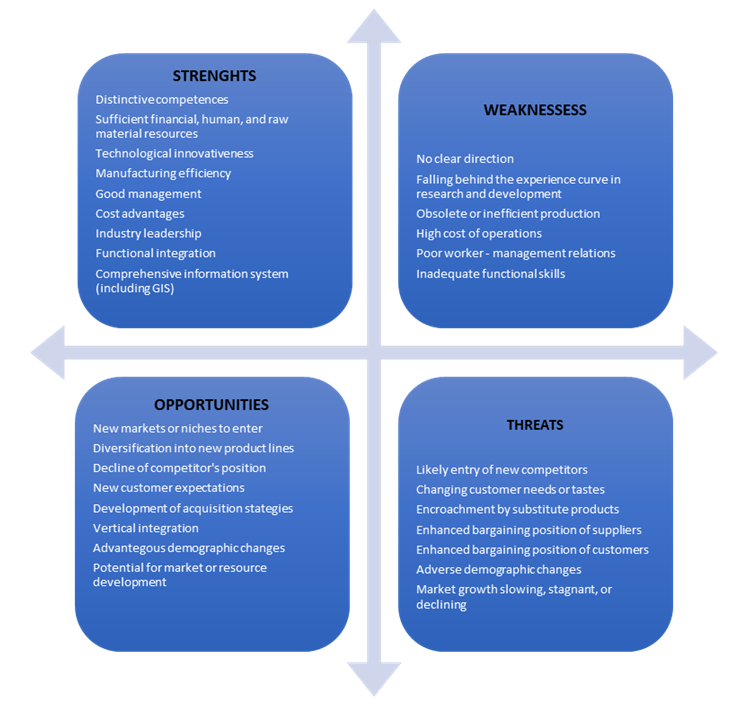 Diagram - SWOT analysis (strengths, weaknesses, opportunities, and threats analysis; Figure 4) is a framework for identifying and analyzing the internal and external factors and pressures that can have an impact on the viability of a project, product, place or person. Figure 4. Example of Questions in the SWOT Analysis (after Obermeyer and Pinto, 1994). Having identified the organization’s goals and objectives—and how GIS will help address those goals—strategic GIS planning moves onto the analysis phase. During the analysis phase, organization members identify gaps between the current support systems in use (GIS or other, if any) and the organization’s strategic goals (identified in the visioning phase). The analysis phase requires GIS planners and designers to address two different kinds of questions. The first set of questions pertain to practices internal to the organization and its use of GIS, and might include: How could the organization benefit from GIS? How might GIS allow the organization to better pursue its goals? What role does / will GIS play for the organization? How many people might use it / interact with it? What kinds of problems do the organization need to solve? What kinds of data will the organization analyze? What is the scope of the organization’s data? The second set of questions pertain to practices external to the organization such as the prevailing trends in the industry and practice. These questions might include, what does the GIS industry look like at large and what could the organization do better with a GIS? Both sets of questions belie a more complicated issue: what metrics will be used to evaluate GIS performance over time, how will the measures be collected, and how will alternatives be evaluated against one another? To address these questions, organizations often use workflow and business process analysis, as well as gap analysis, a business management technique used to identify the steps necessary for moving the organization from its current state to its future desired state. Another round of SWOT analyses could be initiated, this time focused on specific needs. Occasionally other project management tools that help assess multiple criteria, such as radar charts, are also employed during the analysis phase. After completion of the visioning and analysis phase, organizations should have a good sense of both long-term goals, and characteristics of the most desirable GIS that could address those goals. During the direction phase, organization members conduct market research, analyze potential GIS solutions, and make selections for designing the GIS that best suits the organization’s needs. The direction phase often includes the use of business management tools like risk maps / risk profiles, and decision trees, which are useful for evaluating alternatives and assessing the outcomes of different concurrent choices. Risk maps / risk profiles are data visualization techniques for identifying and prioritizing risks faces by an organization or a business. Decision trees are graphs or models that support the analyses and representation of the decision logic and outcomes; probabilities and resources could also be included. These and other related tools are essential for determining the value of implementing a new system—they make clear what kind of improvements and Return on Investment (ROI) the organization is likely to see, and how the costs associated with GIS will yield long-term benefits. During this phase, members address questions such as Which GIS should the organization adopt? How should budget, people, resources be allocated? What projects would the preferable GIS allow the organization to undertake? For which potential demonstration projects will the new system be used? During the direction phase, organization members use the business goals identified in the visioning phase and the metrics identified in the analysis phase to make a compelling case for a particular approach to GIS design. After both visioning and analysis, the direction phase makes explicit connections between the organization’s gap analysis and the benefits of a well-designed system. It lays out a clear justification for why the organization’s GIS should be designed in a particular fashion and outlines the necessary budget for doing so. One of the key determinations that happens during the direction phase and enters into the recommendations is about the implementation strategy to be pursued. Assuming that the organizational circumstances, resources and the context are well understood, and the goals of introducing and developing GIS technology are clear, a particular implementation strategy would be suitable. Eason (1988) enlists five possibilities moving from more sudden revolutionary which are also more challenging for users to adapt to, to an evolutionary slow change which is easier to handle. The author labels the possible implementation strategies as: The Big Bang, Parallel Running, Phased Introduction, Trials and Dissemination, and Incremental Evolution. The recommendation phase is crucial for communicating the results of the direction phase, how the design process will unfold, how resources will be allocated, and how the organization will benefit from the proposed changes. The crux of the recommendation phase is that the outputs must be both detailed enough for effective communication, but simple enough to be digestible for the organization’s executives and administrators. Prototype systems are often designed and their timelines charted for evaluation. To satisfy both of these goals, it is often useful to employ data visualization tools such as Gantt and Pert charts which help convey the design and implementation timeline, the necessary tasks that must be completed, and the deliverables that will be generated during each phase. A Gantt chart, commonly used in project management, is one of the most popular and useful ways of showing activities (tasks or events) displayed against time. On the left of the chart is a list of the activities and along the top is a suitable time scale. Each activity is represented by a bar; the position and length of the bar reflects the start date, duration and end date of the activity (Figure 5). Figure 5. An example of a Gantt chart. The PERT chart is sometimes preferred over the Gantt chart, another popular project management charting method, because it clearly illustrates task dependencies. A PERT chart is a project management tool used to schedule, organize, and coordinate tasks within a project. PERT stands for Program Evaluation Review Technique. It presents a graphic illustration of a project as a network diagram consisting of numbered nodes (either circles or rectangles) representing events, or milestones in the project linked by labeled vectors (directional lines) representing tasks in the project. The direction of the arrows on the lines indicates the sequence of tasks. In the diagram included in Figure 6, for example, the tasks between nodes 1, 2, 4, 8, and 10 must be completed in sequence. These are called dependent or serial tasks. The tasks between nodes 1 and 2, and nodes 1 and 3 are not dependent on the completion of one to start the other and can be undertaken simultaneously. These tasks are called parallel or concurrent tasks. Tasks that must be completed in sequence but that don't require resources or completion time are considered to have event dependency. These are represented by dotted lines with arrows and are called dummy activities. 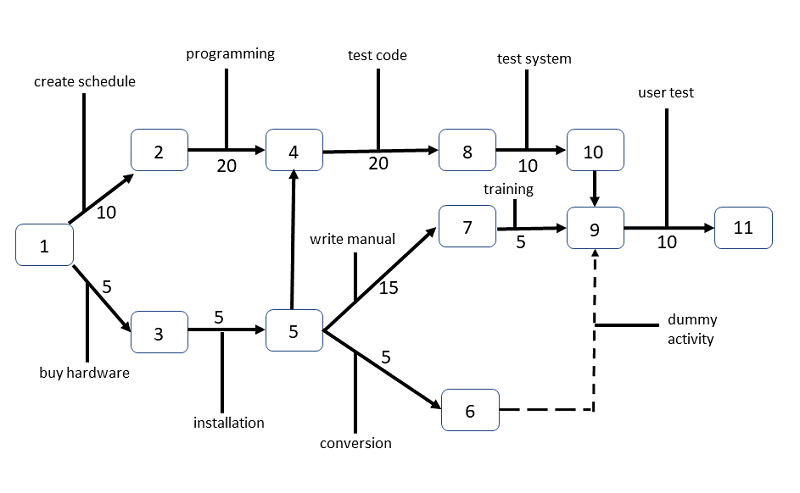 For example, the dashed arrow linking nodes 6 and 9 indicates that the system files must be converted before the user test can take place, but that the resources and time required to prepare for the user test (writing the user manual and user training) are on another path. Numbers on the opposite sides of the vectors indicate the time allotted for the task. One shortcoming of PERT chart is that it can be difficult to interpret, especially on complex projects. Frequently, project managers use both techniques. Figure 6. Illustration of a PERT Chart. Numbered rectangles are nodes and represent events or milestones. Directional arrows represent dependent tasks that must be completed sequentially. Diverging arrow directions (e.g., 1-2 and 1-3) indicate possibly concurrent tasks. Dotted lines indicate dependent tasks that do not require resources. Source: modified from a diagram in TechTarget. Finally, during the recommendation phase, it is important to remember the need for flexibility during the GIS implementation process. Over the last decade, software development (including information systems of all kinds) have embraced the philosophy of “agile development,” a set of principles that borrow from socio-technical design. Key to the philosophy of agile development is that any software of system development should be done with carefully while constantly reconsidering the needs of its users and adjust its design according to their needs. The planning process, is thus circular and never-ending, as the organization is constantly re-evaluating the GIS in terms of how it could be improved to better suit the organization’s needs. Although the recommendation process is the conclusion of the typical GIS design planning cycle, it is also a signal to begin the process once again. Much of the literature on the design of Information Systems (IS) in general, and Geographic Information Systems (GIS), in particular, is bifurcated into silos with research on the one hand and practice on the other. Early research on GIS design and implementation tended to focus on the technical details of hardware and software systems, the tradeoffs between different infrastructures, and the analytical capabilities GIS could offer (see for example Aangeenbrug, 1991; Goodchild, 1991; Huxhold, 1991). Slightly more recent work has focused issues related to the management, adoption, and strategic governance of IS/GIS in different organizational contexts (see for example Eason 1988; Obermeyer & Pinto, 1994; Huxhold & Levinsohn, 1996; Cassidy, 2005, Tomlinson, 2007). While both of these literatures meet under the broad rubric of “information systems”, the former is often conducted by computer scientists and software developers, whereas the latter is often conducted by business managers, organizational theorists, and GIS professionals. This bifurcation can be a major stumbling block for individuals and organizations looking to design an effective GIS because there is no single resource that provides guidance from the perspectives of both research and practice. In this article, we present Cassidy’s four-step information systems strategic planning model that draws on both the research and practical perspectives. It embodies the elements of strategic planning and incorporates the socio-technical design, the dominant approach in contemporary IS scholarship and implementation practice. Together, these elements make the four-step planning model an essential component of any successful GIS design process. Aangeenbrug, R. T. (1991). A critique of GIS. Geographical Information System: Principles and Applications, 101-107. Alter, S. (2003). 18 Reasons Why IT-Reliant Work Systems Should Replace" The IT Artifact" as the Core Subject Matter of the IS Field. Communications of the Association for Information Systems, 12(1), 23. Alter, S. (1999). A general, yet useful theory of information systems. Communications of the AIS, 1(3es), 3. Babbie, E. R. (2013). The basics of social research. Cengage Learning. Cassidy, A. (2016). A practical guide to information systems strategic planning. CRC press. Eason, K. (1988) Information Technology and Organizational Change. Taylor & Frances. Goguen, J. A. (2004). Semiotics, compassion and value-centered design. In Virtual, Distributed and Flexible Organisations (pp. 3-14). Springer Netherlands. Hevner, A. R., March, S. T., Park, J., and Ram, S. (2004). "Design Science in Information Systems Research," MIS Quarterly, (28: 1). Huxhold, W. E. (1991). An introduction to urban geographic information systems. New York, NY: Oxford University Press. Huxhold, W. E. L. & Levinsohn, A. G. (1995). Managing geographic information system projects (No. 910.285 H81). Nunamaker Jr, J. F., Chen, M., & Purdin, T. D. (1990). Systems development in information systems research. Journal of management information systems, 7(3), 89-106. Obermeyer, N. J., & Pinto, J. K. (1994). Managing GIS. New York, NY: Guilford Press. Simon, H. A. (1969; 1996). The sciences of the artiﬁcial. Cambridge, MA: MIT Press. Tomlinson, R. F. (2007). Thinking about GIS: geographic information system planning for managers. Redlands, CA: ESRI Press. Why plan for GIS design? Who should be involved in planning for GIS design? What factors should an organization consider in GIS design?